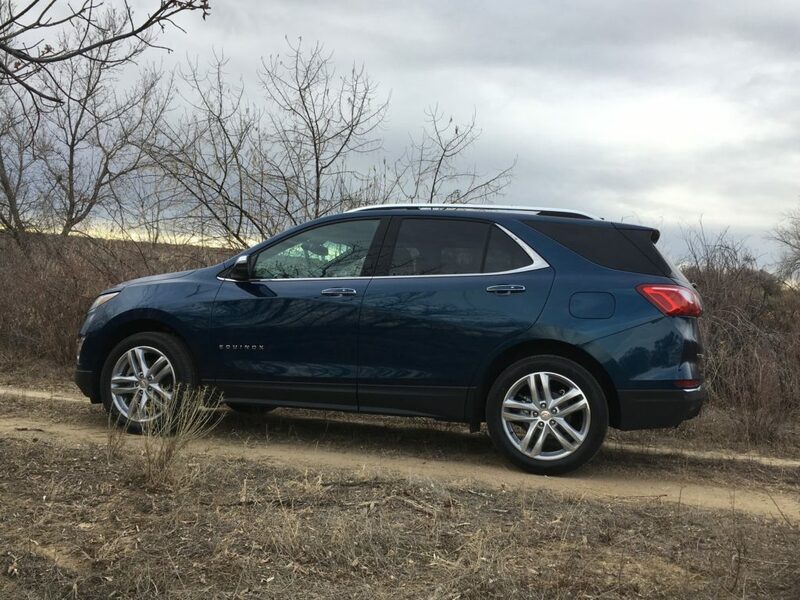 As General Motors pursued plans for eliminating several Chevy and Cadillac sedans and shutting down some car plants, a bright spot in the middle of all the discussion is the Equinox, one of the five best-selling compact SUV crossovers in the country. Those of us who have been around for quite a while still think of GM and Chevrolet for their big, tough, good-riding SUVs – the Suburbans, Tahoes and Yukons. Chev’s bread-and-butter models, though, are the Equinox and Traverse crossovers. The Equinox, on its unveiling in 2004 as an ’05, was the company’s first departure from those truck-based sport utes. It was a practical alternative for families seeking to lower their investment in car-carrying responsibilities. Five years after its introduction, the midsize Equinox was redesigned, then a year ago it took on a new look and was resized into a compact crossover. A shedding of 400 pounds let it run lighter and more efficiently. The new 2019 Equinox, 5 inches shorter than the ’17 model, shapes up very close in dimensions to one of its primary rivals, the Jeep Cherokee. Here is the comparison: Wheelbase- Chevy 107.3 inches, Jeep 106.5; Length- Chevy 183.1, Jeep 182; Width- Chevy 72.6, Jeep 73.2; Height- Chevy 65.4, Jeep 65.7. Experiencing the comfort, handling and performance of the Chevy was enjoyable. Seating is very supportive and the MyLink infotainment system, including Android Auto and Apple CarPlay, is user-friendly. The interior was very quiet; heavy use of plastic detracted somewhat. The Equinox took a hit on cargo space through its resizing last year; its 29.9 cubic feet behind the rear seats is smaller than most compact competitors. The review model I drove was equipped with the optional 252-horsepower, 2.0-liter turbocharged 4-cylinder engine, and, mated to a 9-speed automatic transmission, was impressive. Good low-end torque got it off the line okay, and it was smooth at higher speeds and on demands for passing other traffic. Fuel mileage estimates are 22/28, and my overall average was 26.3. It has the stop/start fuel-saving feature. Turning circle of the Equinox is a bit wider than most competitors; it rides on Hankook 235/50R19 tires. Base engine is a 170-hp, 1.5-liter turbo 4-cylinder with 6-speed automatic transmission. To opt for this engine is to give up quick, smooth shifts and contend with quite a power decline, though this combo carries a good EPA rating of 26/32 mpg. The well-equipped Premier edition of the Equinox needed only one optional package, Confidence and Convenience at an added cost of $2,145. It included eight-way power front passenger seat, ventilated front seats, heated second-row seats, heated steering wheel, low-speed forward automatic braking, forward-collision alert, lane-keep assist with lane-departure warning, following-distance indicator, safety alert seat, automatic high-beam control, adaptive cruise control, front pedestrian braking and surround vision. This brought sticker price to $37,745. Among standard items are a hands-free power liftgate, remote vehicle start, dual-zone automatic climate control and wireless charging device. Cheapest Equinox AWD trim level begins at around $26,500. The Equinox is built in Ingersoll, Ontario, Canada.